Pleasure, according to the ancient Greek philosopher and party animal, Epicurus, is the beginning and the end of living happily. But what if you can’t feel pleasure? For those with a condition called anhedonia, the joy of a first kiss, the deep satisfaction of solving a puzzle, or the warmth of hearing a favourite song are sensations only other people can experience. In strict terms, anhedonia can be described as a sense of emotional flatness that often leads to a loss of a desire for physical intimacy, difficulty adjusting to social situations, or complete withdrawal. Considered more of a symptom than a disease, the effects can be debilitating, with implications that reach beyond an ability to live happily. Boiled down to its most basic principles, pleasure is the feeling we get that drives us to seek out a stimulus. The ability for our brain to feel pleasure serves as a significant control mechanism to bond us together into social groups, and to help us reinforce certain advantageous behaviours. As Joshua Garfield from the Australian drug and alcohol research centre Turning Point, explains, we can break pleasure into two kinds: anticipatory and consummatory. “So if you’ve been invited to dinner with a friend, and they tell you they’re cooking one of your favourite foods,” he told ScienceAlert. While Garfield makes it clear his research into pleasure as a psychologist focuses largely on the individual, he also points out pleasure is a strong social force. Again, Epicurus would agree, claiming pleasure is the beginning of every choice and every aversion. So an inability to feel pleasure is more than just a glum or empty existence. It is an impediment to our ability to learn and interact socially. Just what exactly is anhedonia, though? Our experience of pleasure is the product of neurochemistry inside a circuit of brain bits called the cortico-ventral basal ganglia (BG). A part of the brain called the medial prefrontal cortex (mPFC) acts as a traffic cop for pleasurable acts, allowing oh-so-good dopamine levels to rise in a part of the BG called the striatum and eliciting a pleasant sensation. Research published by Stanford University neuroscientists in 2016 supported previous suspicions that lower activity in the mPFC could be primarily responsible for anhedonia. The fundamental cause of this low activity could be genetic, although stress or trauma early in life in some cases substance abuse can also impact on our brain’s ability to mediate rewards. But is anhedonia a disease in its own right, or a feature of other conditions? “It’s generally considered a symptom, not a primary condition,” Garfield explains. In other words, anhedonia is what psychologists might look out for to contribute to a diagnosis of other conditions, such as depression, schizophrenia, some personality disorders, post-traumatic stress disorder (PTSD), and substance use disorders. It’s also usually treated according to the disorder rather than as a disease in its own right; if depression is considered to be the cause, a physician might recommend personal therapy, medication, or in extreme cases electroconvulsive therapy. Nonetheless, it could be complicated. According to Garfield, genetics or early life stress could make some people generally more vulnerable to conditions linked with anhedonia. “There’s reasonably good evidence that frequent use of addictive substances causes anhedonia,” Garfield says. While it’s hypothesised that this could lead to a feedback loop, Garfield says the evidence for this is mixed and inconsistent. “There’s also a hypothesis that anhedonia may precede addiction and make people more vulnerable to developing addiction,” says Garfield. Clearly, as usual, biology is complicated and doesn’t like to be put into neat boxes. But with 300 million people across the globe with depression, and the condition considered to be on the rise among adolescents, it’s time we got a better understanding of why some people can’t feel pleasure. This entry was posted in Health and tagged addictive substances, anhedonia. Researchers have found solid evidence in support of a century old hypothesis claiming the body’s own immune system plays a strong role in the development of Parkinson’s disease. While it’s not clear if the discovery describes a primary cause or simply makes the existing condition worse, it could point the way to new forms of early diagnosis and ways to reduce the severity of its symptoms. Parkinson’s disease is a neurological condition affecting more than 10 million people worldwide, characterised by tremors, stiffness, and difficulty moving. The symptoms are largely caused by a loss of neurons inside a part of the brain called the substantia nigra, cells that are responsible for producing a chemical called dopamine. Without this, the region can’t effectively filter messages from the brain to the body’s periphery, causing a ‘static hiss’ of movement in the muscles. As far back as 1925 the immune system has been blamed for causing the damage to these brain cells, but since this would require white blood cells to cross the blood brain barrier – something which has long been considered unlikely – the hypothesis failed to attract much attention. In 2014, researchers from Columbia University Medical Center (CUMC) found markers called MHC proteins were displayed on the dopamine neurons, and that the immune system’s T-cells could recognise and attack the brain cells. “Right now, we’ve showed that certain neurons display antigens and that T-cells can recognise these antigens and kill neurons,” lead researcher David Sulzer said at the time. This latest study led by CUMC and researchers from the La Jolla Institute for Allergy and Immunology in California has shown a normally soluble protein that aggregates in the substantia-nigra’s cells called alpha-synuclein can trigger the body’s immune system. They took blood samples from 67 volunteers with Parkinson’s disease and 36 controls, and mixed them with proteins found in nerve cells, including alpha-synuclein. While there was little reaction in the samples taken from the control subjects, there was a clear immune response in those with Parkinson’s, indicating that the white blood cells in their immune system had previously been exposed to the proteins. “Our findings show that two fragments of alpha-synuclein, a protein that accumulates in the brain cells of people with Parkinson’s, can activate the T cells involved in autoimmune attacks,” said Sulzer. So it seems as if T-cells might be fooled into thinking the body’s dopamine producing brain cells are foreign due to a build-up of alpha-synculein, and somehow attacking them. Genetic studies have also shown Parkinson’s disease is linked with a variation in genes active in the immune response, adding further reason to suspect mistaken T-cells are responsible for the destruction of the brain’s nerve cells. “It remains to be seen whether the immune response to alpha-synuclein is an initial cause of Parkinson’s, or if it contributes to neuronal death and worsening symptoms after the onset of the disease,” said researcher Alessandro Sette from the La Jolla Institute for Allergy and Immunology. In recent years, the evidence has been mounting linking the gut with Parkinson’s disease, with gut bacteria stirring up trouble, and possibly affecting the brain via the vagus nerve. As for that blood brain barrier, it might not be quite as impermeable to the immune system as previously thought. A study published in Nature earlier this year showed a link between gut microflora and ischemic strokes. A great deal of research still needs to be done before we have a convincing model bringing together the multitude of threads of genetics, bacteria, and immune responses. And we desperately need one – there is currently no way to diagnose Parkinson’s before the symptoms set in. If the immune system does play a role, not only could we possibly spot it sooner, we might even have a way to slow or stop the dopamine-producing brain cells from being destroyed. “Our findings raise the possibility that an immunotherapy approach could be used to increase the immune system’s tolerance for alpha-synuclein, which could help to ameliorate or prevent worsening symptoms in Parkinson’s disease patients,” said Sette. This entry was posted in Health and tagged Allergy alpha-synuclein antigens attack bacteria barrier blood body brain called causing cells certain clear condition CONTACT control CUMC destruction disease display dopamine evidence findings found, parkinsons. Pharma sector is facing a slow down at a time the sector gears up to be compliant with the Goods and Service Tax(GST) regime which takes off from July 1,2017. The business decline is by over 50 percent at wholesale/manufacturers levels. The pharmacy trade outlets are working to clear out existing stocks and maintain a minimum inventory. There is an uncertainty in the air and most of the outlets which were not paying taxes now will come under the ambit of the GST levy. The small and unwieldy business operations which did not declare their earnings needs to suddenly buck up to the pressure of sharing the revenue details for which are they are unprepared. So these outlets are trying to get rid of the stocks as much as possible and maintain a limited supply. However from July 1, the sector is confident that sales will be brisk and normal. In the case of the small pharma companies engaged in manufacture and marketing are facing a standstill in business operations. This is a temporary phase and we are certain that post GST implementation it will be a win-win situation for the industry and the trade, said industry observers. The best part of GST is that tax evasion will become next to impossible and the system is so designed that self compliance will be the norm in order to remain competitive . Government can expect a very good revenue growth, said Harish K Jain, director, Embiotic Laboratories and secretary, Karnataka Drugs and Pharmaceutical Manufacturers Association. NPPA is likely to come out with a notification soon revising the prices in view of the GST, Jain added. According to Jatish N Sheth, director, Srushti Pharmaceuticals and former president KDPMA, liquidation of inventory has stalled supply chain sales and procurement which has affected revenue generation anywhere from 10-25 percent or even more. “Drug shortage is also looming large. This together with the arrival of monsoon in the country which is phase for the onset of infectious diseases, should not impact patients. More over the monsoon months are most remunerative for pharma companies with a growing demand for drugs for all age-groups and diseases. This time the GST could play a spoil sport. However, we expect business to pick up only after July 15,2017 and for now it is a visible slowdown”, stated Sheth. “For businesses in the healthcare sector, GST is a landscape of discussions, debates and speculations. Now, that the government has exempted healthcare services from GST, it is good news. However, for patients or end-consumers the cost could rise, given the increase in input costs due to GST. Any imposition of high GST on medical equipment would affect the overall cost structure of healthcare,” stated Ameera Shah, Managing Director and CEO, Metropolis Healthcare. This entry was posted in Health, pharma industry and tagged GST, GST for healthcare industry, GST rates, healthcare industry, Pharma and healthcare, pharma industry. “Women who lead a sedentary lifestyle have faster-ageing cells than those who exercise every day,” BBC News reports. This research looked at telomeres – often likened to the caps at the end of shoelaces, they are made up of molecules that protect strands of chromosomes from “fraying”. Telomeres shorten every time the genetic information in cells is duplicated. It’s believed that this leads to cell ageing and death. In a sample of older women, the researchers looked at whether there was an association between time spent sitting down and telomere length. Telomeres are measured in the small sections of nucleic acids that make up DNA, known as base pairs. Among women in the study who did less than about 40 minutes of physical activity a day, those who sat longest had shorter telomeres by an average 170 base pairs. The researchers say telomeres shorten at a rate of 21 base pairs a year – using a rough “back of a fag packet” calculation, 170 equals about eight years. Sitting time did not seem linked to telomere length for women who did at least 30 minutes of physical activity a day. We don’t know whether the results apply to men or younger people. And, importantly, as the study only looked at the women’s activity levels and telomeres at one point in time, we don’t know whether activity levels or sitting causes telomeres to shorten. 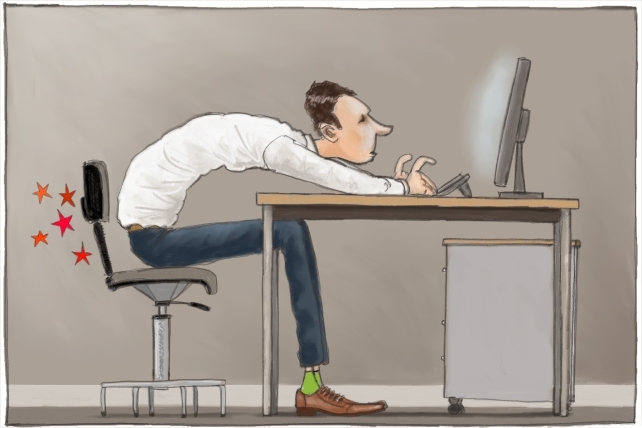 Still, arguably, most of us would benefit from spending less time sitting down. The study was carried out by researchers from the University of California, San Diego State University, the State University of New York at Buffalo, the University of Washington, the Fred Hutchinson Cancer Research Centre, George Washington University, the University of Florida and Northwestern University, all in the US. It was funded by the US National Heart, Lung and Blood Institute. The study was published in the peer-reviewed American Journal of Epidemiology on an open access basis, so it’s free to read online. All of the UK media outlets that covered the study implied that a direct cause and effect relationship between sitting down and cell ageing had been proven. This is untrue. While there certainly seems to be an association worthy of further research, no causal link has been established. This cross-sectional study used data from women taking part in a much bigger study of health called the Women’s Health Initiative. Cross-sectional studies can find correlations between different factors – in this case, sitting time and telomere length. But because this type of study only looks at one point in time, researchers can’t say which factor happened first, so it’s not very useful for telling us whether one causes the other. Researchers used information about 1,481 women aged over 65 who’d taken part in various sub-studies of the Women’s Health Initiative. They used information from women who’d had their physical activity measured using accelerometers (devices that measure movement) and had also given DNA samples that had been tested for telomere length. After accounting for other factors, they looked at whether telomere length was linked to the amount of time spent sitting. The information about physical activity was measured over one week, during which time women wore their accelerometer all the time, except when bathing or swimming. Women taking part also completed a questionnaire about their physical activity and kept a record of their sleep. Telomere length was measured from DNA in blood cells. They also redid their calculations to divide the women into those who did more or less than the average amount of physical activity (about 40 minutes). They then looked at the link between time spent sitting and telomere length for women who did more or less than 40 minutes physical activity a day. They also looked at the link between sitting and telomere length for women who did 30 minutes or more a day, the recommended activity level for all adults. It’s unclear whether these additional calculations were planned from the start of the study, or whether the researchers decided to do them because the initial findings did not show a link between time spent sitting and telomere length. The length of time spent sitting was not linked to telomere length for women who did 30 minutes or more of moderate physical exercise a day. For women who did less than the average amount of moderate physical activity each day, time spent sitting did show a link to telomere length. Among these women, those who spent more than about 10 hours a day sitting had shorter telomeres than those who spent less than about eight hours a day sitting. The average difference was 170 base pairs (95% confidence interval [CI] 4 to 340). 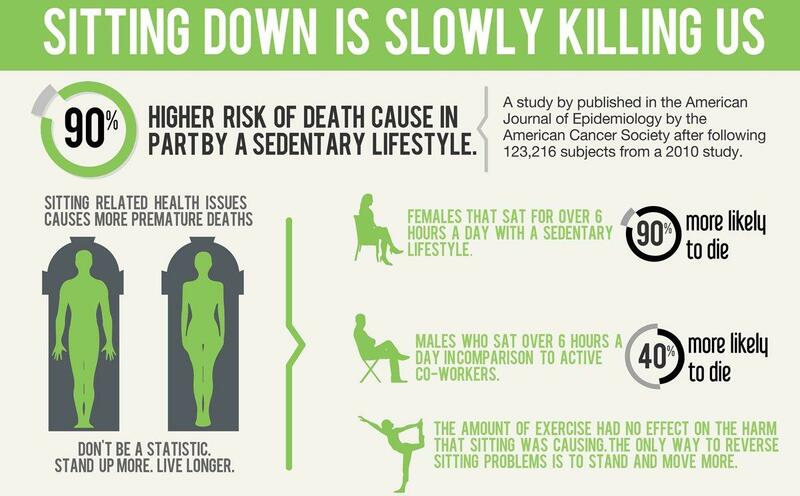 Women who spent the most time sitting were more likely to be older, white, obese and have long-term illnesses. In other words, being both sedentary for long periods and not getting much physical activity may act together to shorten telomeres in blood cells. They speculated that causes of the link might include insulin resistance, lack of the anti-inflammatory responses the body has to exercise, or obesity. They also acknowledged women who have long-term illnesses are more likely to have a sedentary lifestyle, and the illness rather than the lack of exercise may cause shortened telomeres. It’s not news to anyone that being more physically active and spending less time sitting around is likely to keep people in better health. But this study has many limitations that make it difficult for us to rely on its results. While they are used as a marker for ageing cells, telomeres are not a direct measure of ageing. Although shortened telomeres have been linked to certain diseases, everyone’s telomeres shorten over time. Saying shorter telomeres make someone “biologically older” doesn’t mean much. This hasn’t stopped the emergence of private companies offering to measure your telomeres – but it’s unclear what exactly you could usefully do with that information. And the only cells studied in this research were blood cells, so we don’t know whether the results would have held for brain cells, muscle cells or any other cells in the body. Doctors have tried to disentangle the effects of physical activity from the effects of being sedentary before without much success. Generally, as in this study, research seems to show that if you get plenty of moderate to vigorous physical exercise, the amount of time you spend sitting or lying down doesn’t make much difference. The researchers carried out a lot of comparisons and used multiple models to try to show sedentary time was linked to telomere length. In most of these models, once you take account of women’s age, ethnicity, body mass index and long-term illnesses, there was no link. Only when the researchers stratified the results by how much physical activity women did could they show a link in one category: those who did the least physical activity. That suggests sedentary behaviour is not the strongest factor to affect telomere length. Another problem with the study is it only looked at telomere length and physical activity at one point in the women’s lives. We don’t know how much physical activity they’d done throughout their lives, or whether their telomeres had shortened faster than other women recently or at an earlier stage in life. The study doesn’t add much to what we already know: physical activity is likely to be beneficial for people at all stages of life, and everyone should aim to get at least the recommended level of 30 minutes of moderate to vigorous physical activity a day. This entry was posted in Clinical Research, Clinical Trial, Health.